4/6 Santorini Arts Factory, Vlycahda. The artistic activities of Santorini Arts Factory start on June 4rth in the Tomato Factory of the Nomikos family in Vlyhada. This year the artistic program includes Visual Art Festival ORANGE WATER, organized under the auspices of the Ministries of Culture & Tourism and the Dutch Embassy. From 4/6 to 30/9 September, artists Apostolis Zolotakis and Kelly will present their personal exhibitions with works exclusively created for this specific venue. In addition, from 4/6 to 1/8, selected works from the first ORANGE WATER cycle will be presented under the title “Memory Landscape”, so as to raise the awareness of the public in Santorini about the actions of the international Greek-Dutch Festival. 1-7/7 Various Locations. A number of concerts organized by DAPPOS: S. Tseros (1/7) in Imerovigli, F. Hrysou (2/7) in Pyrgos, Emmelon (4/7) in Megalohori, Famileia (5/7) in Oika and Tehnasmata (7/7) in Fira. 9/7 Pyrgos. Exhibition “1956-2016”. Rare photographic material, newspapers and testimonies from the catastrophic earthquake that broke out 60 years ago and has been the most tragic moment in the contemporary history of Santorini (Organized by Estia of Pyrgos). 13-17/7 Indoor Gym, Fira. This year the Strongili Festival presents some of the greatest names in Greek music: Mitsias-Dagaki-Siolas (13/7), F. Pliatsikas (14/7), Μario (15/7), Ν. Ζiogalas - V. Kazoulis (16/7), H. Thiveos (17/7). 19-31/7 Santorini Arts Factory. Τhe June concert program of Santorini Arts Factory includes: Maraveyas (19/7), Gadjo Dilo (24/7), Markus Stockhausen (27/7) and “A Journey to Lyrical Song” (29/7). If you love dancing, you can enjoy Aenaon Dance Theatre (21/7) and the Acrobatic Dance performance “Pray for Nothing - Solo Juntos” (31/7). 22/7 Gyzis Mansion. Concert with Julia Rutigliano. 25-26/7 Santorini Arts Factory. Do not miss the theatrical performance of Aristophanes’ “Ornithes”. 25/7 Pyrgos. Photo exhibition by Konstantinos Fytros entitled “The miracle of Pyrgos”, presenting church steeples and paths in Pyrgos (organized by Estia of Pyrgos). Indoor Gym, Fira. 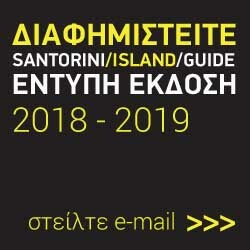 The Sports Cultural Environmental Organization of Santorini DAPPOS presents a series of seminars within the context of the Santorini Circus Festival. 2-19/8 Santorini Arts Factory. SAF presents the following theatrical plays: Socrates Now (2/8) by G. Simonidis, “The Crutches or How I learnt to Walk” (silent theatre) (9/8), “Stamatia nee Argyropoulou” (11/8) by E. Ouzounidou, “Plato’s Apology of Socrates” in ancient greek language (16/8 & repeated on 6/9) by D. Avdeliodis, a theatrical comedy monologue (19/8) by the important theatre person V. Papavasiliou. 4-27/8 Santorini Arts Factory. SAF presents the following concerts and musical performances: “My Mother Greece” (4/8) by S. Xarhakos, “Optima” (18/8) with V. Trigas and M. Karamolegou, Lunatics’ Tribute to Pink Floyd (21/8), Psarantonis’ concert (24/8), and high-spirited Jazzmatazz (27/8). 5/8 Santorini Arts Factory. Within the context of the OW2 group exhibition named “FATA MORGANA”, works of distinguished Greek and Dutch artists are exhibited in Santorini Arts Factory in Vlyhada from 5/8 to 30/9. 6/8 Indoor Gym. Concert with legendary M. Plessas. 6/8 Santowines Winery. On the first Saturday of August, do not miss the “Feast of Vedema” (Feast of Grape Harvesting) held in Santo Wines in Pyrgos. The producers’ children feature scenes of the grape picking process, while you can enjoy food, traditional music and dance. 6/8 Pyrgos. A great local feast is organized on 6/8 in the central church of Pyrgos where the villagers prepare fava and tomato balls. On the feast’s eve, there is lots of music and dancing with live local orchestra. 8/8 Pyrgos. Theatrical performance for the great Greek writer N. Kazantzakis. Organised by Estia of Pyrgos in cooperation with DAPPOS. 18-21/8 Babel Studio, Pori. The 4-day dance seminar “Into the Rhythms of life”, is held in Babel Studio in Pori. It is a dance seminar based on Gabrielle Roth’s 5Rhythms ‘Dancing & Movement Dialogue’, taught by Eckhart Tolle. For registration and further information, call +30 2286071213. 25/8-7/9 Pyrgos. Painting exhibition by Architect Stella Spanou held in the exhibition hall of the central square in Pyrgos. 25/8 Perissa. Do not miss Monsier Minimal’s concert organized by DAPPOS. 3-4/9 Santorini Arts Factory. Motimaru Dance Company presents dance performance “Twilight”. 4-25/9 Fira. Cultural Association “The Friends of Santorini”, and its Founder/ Artistic Director Mrs Athina Kapodistria, present the 38th International Music Festival of Santorini, at the Conference Hall Petros M. Nomikos, with great concerts from 4th to 25th September starting at 21.00. This year’s program includes: 4/9: Santorini Festival String Orchestra, Conductor: Miltos Logiadis, Piano Soloist: Athina Kapodistria in works of Bach, Verdi etc, 6/9: Athens String Quartet, 11/9 Works for Flute and Piano, with Giuseppe Nova (flute) and Marco Sollini (piano), 14/9: “Dedicated to my friend Sarasate” with Anna-Maria Valderama (violin) and Luis del Valle (piano), 18/9: Maria Mazo Piano recital, Winner of international piano competition “Grand Prix - ΜΑRIA CALLAS 2015”, 25/9: Greek Opera “Markos Botsaris” composed by Pavlos Carrer (performed in concert form). 10/9 Fira. Do not miss a special event dedicated to Indonesian Dances, organized by DAPPOS. 17/9 Fira. One of the most impressive events organized by the Municipality of Thira entitled “Ifestia” (Volcanoes) is held on the third Saturday of September. 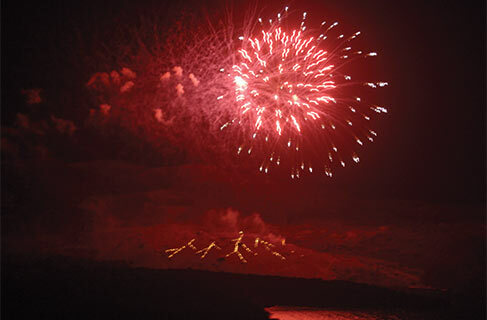 Find a good spot in caldera to enjoy the super show with fireworks symbolizing the volcanic eruption. On the very same night, there will be a live concert with J. Spanos at the Metropolitan Cathedral area in Fira. 24/9 Fira. If you like jazz ethnic rhythms do not miss the Lust-Lust concert. 4/10 Oia Art of Motion by Red Bull is one of the top sports events hosted in Santorini every year. The parkour competition with athletes from all over the world will take place in Oia on 4th October. 7-9/10. Santorini Experience is organized for the second time with sports activities such as running and swimming. 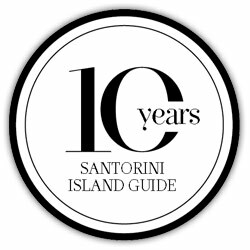 For further information about all activities, visit www.santorini-experience.com. 15/10 Gyzis Mansion. Gyzis Mansion presents the Opera “The Medium Project”. 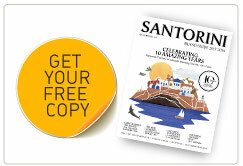 This year Santorini is celebrating 150 years since the volcanic eruption of Nea Kameni. 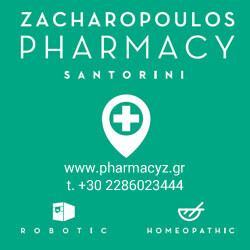 As Mayor of Thira Nikolaos Anastasios Zorzos points out, “it was because of this eruption that the island of Santorini attracted the high scientific interest of multidisciplinary groups worldwide”. The exhibition “1866- 2016: 150 years since the volcanic eruption” opens up on 11th September 2016 in the Gallery at the Central Square of Pyrgos. On display will be rare documents, original engravings, books, newspapers and magazines dating back to one of the most important historical periods for the evolution of Santorini. The exhibition is presented within the context of “Ifestia Festival 2016” under the direction of L. Zorzos. In La Ponta, at the Venetian Castle (‘Goulas’) of Akrotiri, you can enjoy historical guiding tours and musical performances every day (12:00-12.45 & 18.00-18.45). Mondays, Wednesdays & Saturdays: concert “Sounds from the Castle”, Tuesday & Friday: concert “Notes of Centuries”. Concerts start at 21.00. 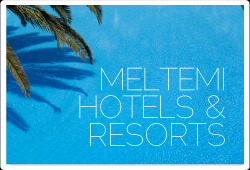 For further information, visit www.laponta.gr. At Santowines Winery in Pyrgos every Tuesday, Friday & Sunday, from July to September, Marina Dimitriou presents Methexis of Santorinian Wine & Music with lounge Greek and foreign songs –starting a little before sunset time. On 11/7, the children’s theatrical play “Xana Zoo” is performed in the Indoor Gym in Fira, while the Copernicus Theatre Group presents “Two Stubborn Spoons” in Santorini Arts Factory in Vlyhada. On 10/8, the Copernicus Theatre Group will present the play “Mr Kih and the Secret Box of Sounds”.